"I was born with a chronic anxiety about the weather," said John Burroughs in 1877. Today, anxiety about the weather is more common than ever, although it’s not inborn but cultivated in schoolrooms, through television sets and by lying, rapacious ex-vice presidents. And I have anxiety about the weather, too — especially when it’s being used to promote a destructive agenda. This brings us to Climategate, the scandal everyone is talking about and that inspired British journalist James Delingpole to write “it's [the climate con is] all unravelling now.” I only wish I could be so optimistic. Sure, we have the smoking gun of the hacked emails from the University of East Anglia, which provide evidence that we “deniers” were only denying a lie. And the erstwhile head of its Climatic Research Unit, Phil Jones — a con man with a science degree if ever there were one — had to resign in disgrace. But don’t for a moment confuse a smoking gun with a coup de grace, or being sacrificed for the team with waving the white flag. I say this because I long ago realized something about man’s nature, something that may sound like a gross exaggeration: If a person has a strong enough vested interest in believing 2+2=5, he will surely insist it is so — in the face of all evidence to the contrary. But before I talk about who the real deniers are and what is being denied, let’s discuss the ugly reality reaffirmed by Climategate. Here is the lowdown in a nutshell: Governments have used billions of dollars of our money to fund fraudulent science, which, in turn, is used to justify policy that would steal untold billions more from us through taxation and the handicapping of the private sector. This will, of course, stifle the creation of wealth, but it will also be a transfer of it. But this would not be so much from the rich to the poor; it would be from the poor and middle class to the rich and well-connected. 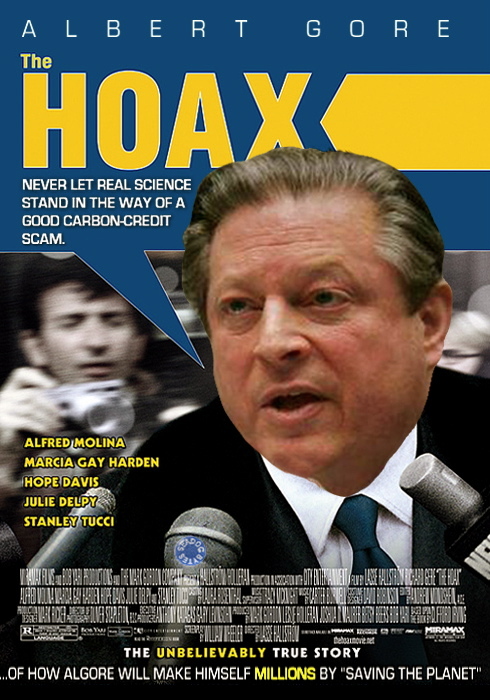 Carbon-credit con men such as Al Gore will add to their many millions, while subtracting from the many millions some of the latter’s few dollars. It would move us toward a situation in which we’d have two Americas, as John Edwards might say. One would be a lying, covetous ruling class of John Edwardses. The other would be the masses, who would be perpetually mired in serfdom. Yet defeating the climate con won’t be easy, because it isn’t just money that drives the con men. In fact, many of them are so married the climate con that they have become one with their misguided notions. Call it the Zen of Being Wrong. One reason not to do wrong is that an ounce of prevention is worth a pound of cure. Obviously, Bill Clinton, John Edwards and Tiger Woods would never have felt the urge to lie about their affairs if they had never had affairs. Of course, the lying was immoral, but this is how one sin leads to another. A transgression leads to a lie, which leads to a full-blown cover-up, etc. And the deeper you dig that hole, the harder and more painful it is to climb out of it. In the case of the climate con artists, the pain would be great and the price steep. Their creed has been likened to a religion, and in many ways it is. They aren’t global-warming theorists. They have invested so much of their time, energy, emotion, ego and reputations in the climate con that to relinquish it would be to relinquish themselves; to call it a lie is to call their lives a lie. It’s just a bit like asking a Jihadist to give up Islam. These are not people who subscribe to AGW theory; they have submitted to it. Then you have those who are using this religion to make money — and they and the true believers are often one and the same. These are the carbon-credit capitalists, the green-technology givers and greenback grabbers. And we have to add to this the fact that all these people had become science’s Torquemadas, inquisitors bent on stifling inquisitiveness. Al Gore told us “The debate is over” as he and his co-religionists strove to root out heresy and sought to destroy the “deniers.” Thus, they have no reason to expect mercy. Surrender is simply not an option. So forget about icebergs; the meltdown the climate con artists fear is that of their reputations, egos, finances and faith. Scientists or not, to admit error is not merely the alteration of a hypothesis to them; it is the loss of religion and meaning, the end of empire, the fall of Rome. It is complete and utter personal destruction. Yet destruction is precisely what the climate-change con men would visit on the economies of nations in their delusional grip. Other lands, such as China and India, will never yield to such insanity. They may pay lip service to it, though, especially if doing so will encourage us to more thoroughly handicap ourselves. Then they can laugh and rise to prominence while we become the most recent great civilization to descend into backwater status. As I write this, the climate-change con artists are meeting in Copenhagen, where useful-idiot communists are protesting in the streets while their standard bearers, Venezuelan President Hugo Chavez, Zimbabwean strongman Robert Mugabe and Bolivian President Evo Morales are railing against free markets and beating the red drum. Do you really think these folks care about the environment? The green that really concerns them is your money — and I do mean your money. Because if there is an “international” agreement to fight the phantom of climate change, you can bet your depreciating bottom dollar that we Americans will pay the freight. We are, after all, the world’s biggest energy suckers. The question is, are we just the world’s biggest suckers? Chavez, Mugabe and China are betting yes. And if we want to make fools out of them, we’ll cause radical climate change — to the political climate in Washington in 2010. It’s probably our last chance to prove who the fools really are.